I got my aluminum center vents in today. They look great and I hope to put them together some time next week. We used small clamps to center everything and screwed the outer ankle pieces on. If I have time this weekend we will glue the thin calve pieces on as well and be done with our glue up. Here is a mock up of how the slider will work. Did not have much free time today but I did get a chance to finish making my periscope brackets out of some "L" channel aluminum I got from the local hardware store. Two will be for mounting it to the dome ring, one will be for the periscope itself, and the last is just encase I mess one of the others up. As of this morning I am now down to 227.6 so I am happy. Considering my starting weight was 247.0 I am just a hair shy of loosing 20 lbs to date! 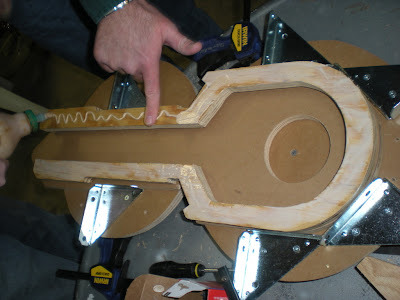 Everyone in the local area of the club came over tonight to work on legs and finish mocking up a motor mount design. 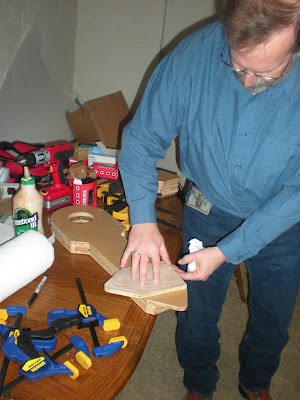 We started off by making a template for the wood center foot cut outs. Then we took a motor mount template and compared it to another I modified to fit in an omniball and a bracket to hold it. A little more tweaking and the group thinks we will be good to go to make 5 sets. Our newest member of the group, Steve, will be getting us the aluminum to make the mounts as soon as we are ready as well as most of the harware. 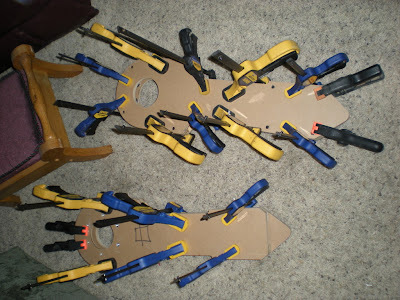 Glued up some more legs. Did not have much time to do anything in the past few days but got a bit of time tonight and installed my coin slots. Plus I put a coat of rub on silver on my resin center vents, now they are all shiny. 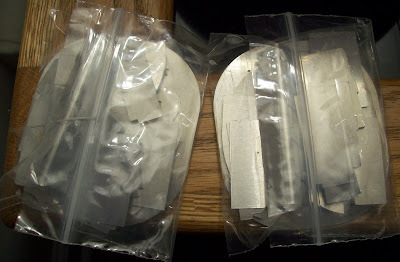 I also ordered 2 sets of aluminum inserts for the surrounds. 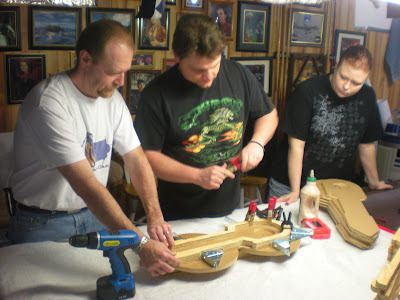 Tonight Little City, Brad and Jen came over to glue up another set of legs. 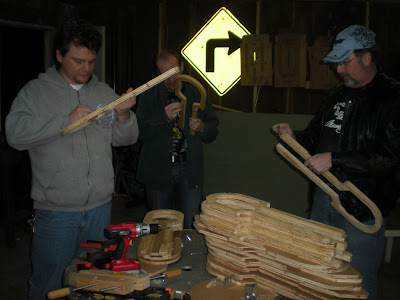 The set being glued is L.C. 's, we got a pattern down from yesterday so it only took us 15 minutes from start to finish. 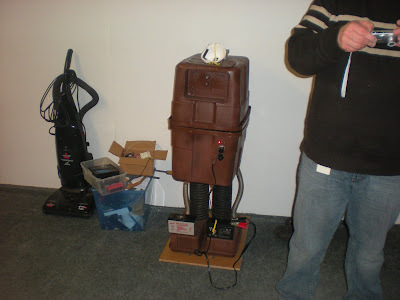 With all the extra timewe had I showed them my battery recharging gonk. LC even took the time to sport the R4 dome Jen and I got glued together before the guys arrived. 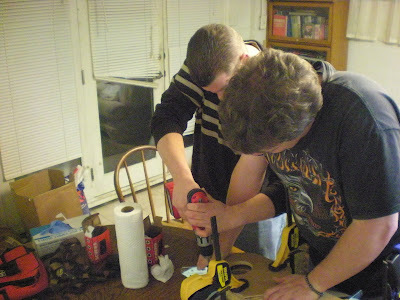 Fellow builder Brad came over to help glue a few back sides on the legs. We used my legs as the guinea pigs just encase we messed something up. Here is Brad taking all the old positioning screws out of the legs. 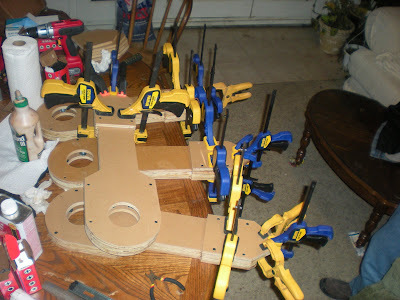 Here is my set of legs glued together and drying. We ran into hardly any problems. All the screw you see will later be covered by various parts and not seen. Tomorrow night we will glue up another set. I took Ed's head out of the clamp tonight and everything seems to be holding great. Still a lot of clean up to do but the Tech-Bond seams to be a winner. Fellow builder Brad held the pieces of the head together while I took a picture of it on Patches body. I think Patches head did not like the idea much LOL. In a few weeks I will start to permanently glue the top of the head to the base ring. I then added a piece of styrene to the inside of the PVC to make up the difference in slack that the mini-servo had. Everything fits snug inside. Now I need to go get a servo extension wire so I can mount the servo permanently with some jewelers screws. Once that is done I can make a new mounting plate for the periscope itself. Went over to Brad's today to help him rewire part of his house. 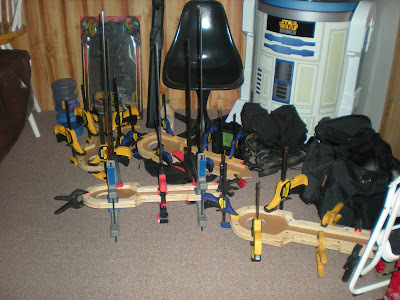 I also brought some of the other legs that we had yet to be glued up. So Brad, Jen, Clay, and me did that after doing the wiring. After letting the legs dry for a day or two we will do some more. After a little bit of rewiring to make the unit more compact so the wires don't show in the light I got the interior of the periscope done. It will run off the spare 3.3volt connector in the dome. 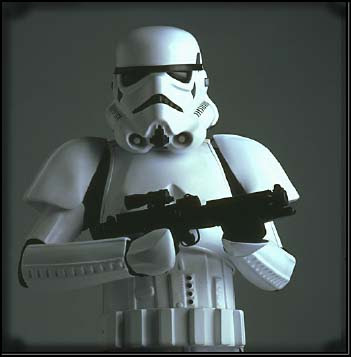 There are all different kinds of Storm Troopers and Clone Troopers; 501st, elite, snow, heavy, scout, advance recon commandos, commanders, you name it. So now I am going to make my own kind of trooper, a "FIT" trooper! I have been real heavy the past 3 years sence my current medical problems got in the way, my new years resolution this year is to get in shape enough so I could wear a Stormtrooper outfit at least once in my life without busting out the seams. So far I am doing good, I am down to 230 from 247. I have hit a platue this month because i can not exercise as hard as I used to and I am finding myself slaking a bit because of it. 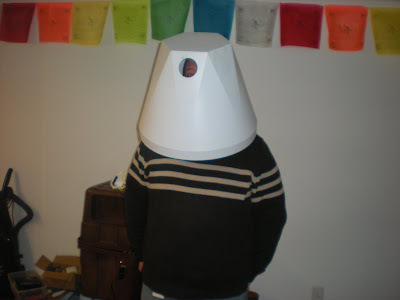 In my R2 Blog you can see how my weight goes up and down in the few photos I let myself be in. So now it is time to step it up a notch and push threw the pain of my body's weaknesses. 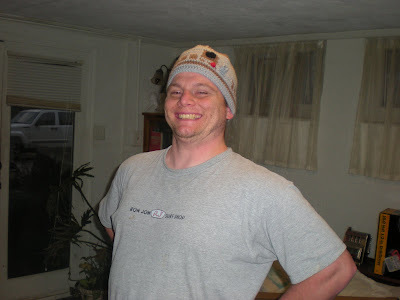 My goal weight is not a rail thin 180 like I used to be in High School but a manageable 195/198. So if I can loose this last 35 lbs and keep it off for at least 2 months I will treat myself to don the outfit at least once this year. 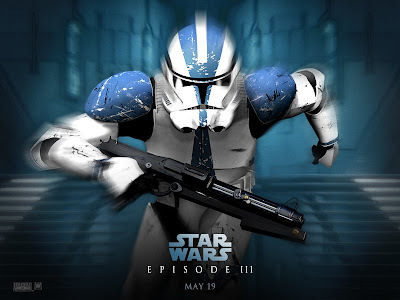 If I can keep it off all the way till 2010 I may just make my own 501st clone trooper like the one below. After taking another half hour to scrub off some more packing tape the temp clamp let loose and the epoxy I tried at the end of the main seam cracked. So I am going to try out my new Tech-Bond glue. I covered my clamp in blue tape and filled the seam with glue. I then clamped it tightly together. I manually held the rest of the seam together and shot it with the activator. It is kinda hard to judge the proportions of the spider with what few pictures there are of it so I bought a toy version of it on Ebay for $6. Now it will be easier to scale up everything to the size I want. 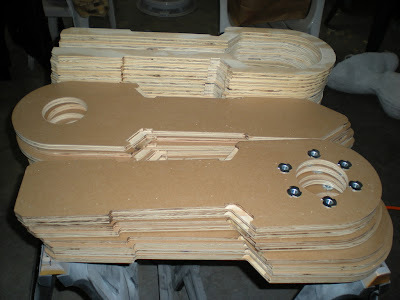 Leg Jig and Glue up. Yesterday fellow builders L.C., Dash, Brad, and Clay came over to work on the 5 sets of legs. We started off the night by taking off all the fuzz on the ends of the pieces. 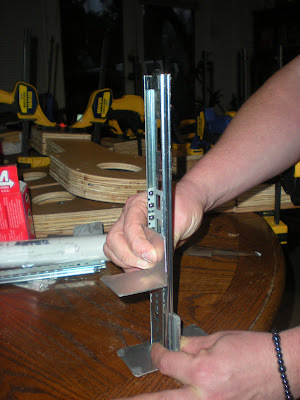 We then finished making the simple jig to hold the pieces as we glued and screwed them. 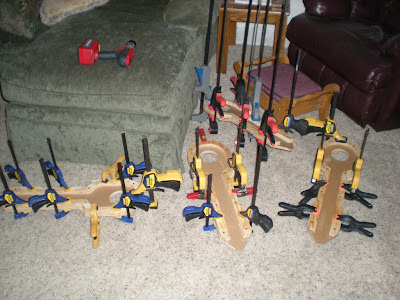 Once we used up all the clamps we had, the few legs that were put together were set in my living room to dry for a few days. Saturday we will do some more glue up. Today was the first warm day of the year so I thought I would take a long lunch break and get some parts primed and painted. I started by taking off the pieces I wanted to work on that were temporarily hot glued to Patches. One of the large door panels was separated in a corner so I used the Tech-Bond to glue it back together. After it was dried I cleaned all the parts with mineral spirits. Then gave some of them a coat of Ithorian Brown paint. I left them to dry while I went back to work. Once I got home they were still super tacky and the weather was getting cold again so a second coat will have to wait. Movie of lancers Hockey Star Wars night. Fun Star Wars night at the Lancers game! Photos by Falcon One. Patches sneaks off to watch a few minutes of the game.